Today is the official feast of St Devote, patron saint of Monaco, and the festivities are well under way. 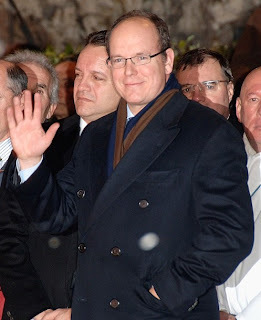 Last night HSH Prince Albert II participated in the traditional ceremony which starts with a torch-lit procession ending with a small religious ceremony and blessing by the Catholic prelate of Monaco with the Sovereign Prince and others setting fire to a boat resting on a stake adorned with olive, pine and laurel branches at Port Hercules. This commemorates the events of 2,000 years ago when a boat carrying the body of St Devote was guided by the Holy Spirit to the port of Monaco and more particularly a latter attempt to steal the relics of St Devote which was miraculously stopped and the boat of the robbers burned. This morning the relics of St Devote will be brought out for veneration and the Princely Family will attend a Pontifical High Mass in honor of St Devote followed by a religious procession. To wrap it all up the usual fireworks display will be held tonight. Despite all the changes of the modern world the Catholic roots and traditions of Monaco are maintained. 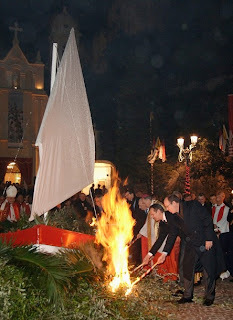 The boat burning ceremony is a slightly more recent touch being started in 1924 by HSH Prince Louis II. For more information on the life of St Devote and her history of veneration in Monaco read her post here. This comment is not about the St Devote post at all, but about your blog in general. Love your site. You make the history of Monaco and its ruling family accessible as your writing is a pleasure to read. One request: Would you consider adding citations and links to original sources where available? This would be particularly welcome for posts about historical events (as opposed to current events), for which there is a paucity of information online. Thank you for the time and effort you put into this blog. It is appreciated. Thank you for your sentiments, glad you like the blog. If I had my 'druthers' this blog would be alot heavier on history, especially the early history of Monaco and the Grimaldis but there is very scarce info available and even less so in English. Most of my posts on history are done from memory without anything write in front of me (makes it easier to summarize) but most of it comes from just a handful of books, I could think of a couple in English and one in French off-hand. I don't know if I would ever have the time to footnote every post but a booklist might be possible or perhaps a series of posts on some of the books I keep on hand, giving my review of each. I will try to do something (I know, *try*) as one of the things that annoyed me and helped motivate doing this blog was the lack of info on the history of Monaco -plenty about tourism, attractions & family gossip, but not much on the history, so I do know where you're coming from. Thanks again for reading. Vive l'Monaco!